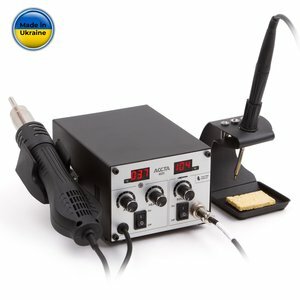 Accta 401 – dual-channel hot air soldering/desoldering station with soldering iron designed for operation with soldering tips of Hakko T12 standard. The package includes a hot air gun, a soldering iron, hor air gun and soldering iron holders, Hakko soldering iron tip and hot air nozzles. Soldering iron heat-up time up to 10 seconds (depends on the tip). Soldering iron auto sleep mode function. Soldering iron compatibility with Hakko T12 standard replacement soldering tips (original Hakko T12 and AOYUE WQ). Accta 401 Hot Air Rework Station – 1 pc. Hakko T12-BC2 Soldering Tip – 1 pc.